In this current series I have continued my exploration into the ways in which we conceptualize and make sense of our everyday life through the thematic investigation of the decision-making process. The “Decision Maker: Case Study Series” is a series of work that investigates subjective interpretation through a set of ‘decision making tools’ in an environment of excess. In this series, I have attempted to align concepts of excess and more temporary ways of thinking about objects with associations and applications of the arbitrary or chance to produce sculptural prints. 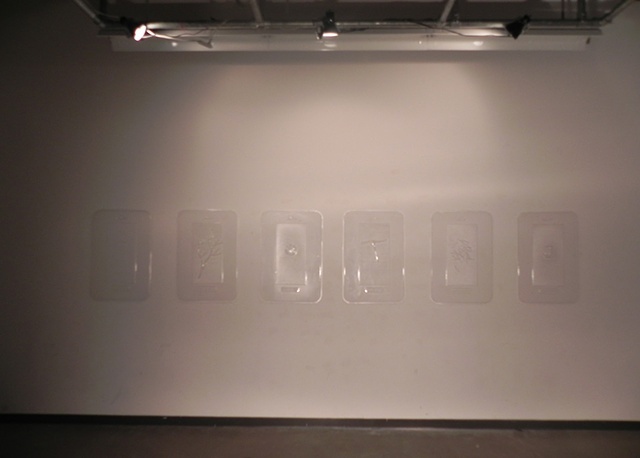 In these prints, the ephemeral contemplative object meets the mass-manufactured process as in this work everyday found objects become ‘decision making tools’ through a vacuum seal process and then their shells are mounted directly onto the wall. This kind of forming process follows the same convention as that used in mass manufactured toy packaging. This is the kind of packaging in which small handheld-sized objects, such as action figures or games, are encased. In these prints, however, each container is essentially empty and redundant because of its lack of content and excessive scale in terms of manufacturing conventions. The specific forms within the packaging include coffee cups, sticks, toothpicks, gum packages, whirlybird helicopters, and notepad pages, all of which are seen within the context of decision making tools as identified as such on the text plates of each case. While the use of these objects as decision-making tools is rather unconventional, their inclusion brings about a reference to subjective interpretation. These objects then become objects of contemplation, and in this context they serve to engage with a kind of meditation or confirmation beyond the self. In this way these objects begin to reference ancient divination forms; however, the objects themselves are left out, the carrying cases are left empty and the objects are presumably being used for decisions. The “Decision Maker: Case Study Series” presents a series of pieces that at first glance facilitate a decision, and on second glance open up the possibilities of a decision. The pieces negotiate between a space of redundancy. They are packages that would not exist in the real world in this scale, nor would they contain these ephemeral, throw away items, they contain references to decision making items that do not decide, and to carrying cases that are essentially empty. They are packages that attempt to help with excess choices, packages meant to help decide between packages on a shelf. In this way there is an emptying quality to this series, an emptying out of rationality. The work within this series, expands upon and reacts to a modern crisis. These pieces respond to an anxiety, my anxiety, at a time when there is a proliferation of choice in all manner of subjects, and for which rational factors are no longer sufficient to sustain.